On a winter night on a remote Nebraska road, twenty-seven-year-old Mark Schluter has a near-fatal car accident. His older sister, Karin, returns reluctantly to their hometown to nurse Mark back from a traumatic head injury. But when Mark emerges from a coma, he believes that this woman–who looks, acts, and sounds just like his sister–is really an imposter. When Karin contacts the famous cognitive neurologist Gerald Weber for help, he diagnoses Mark as having Capgras Syndrome. The mysterious nature of the disease, combined with the strange circumstances surrounding Mark’s accident, threatens to change all of their lives beyond recognition. The mysterious nature of the disease, combined with the strange circumstances surrounding Mark’s accident, threatens to change all of their lives beyond recognition. 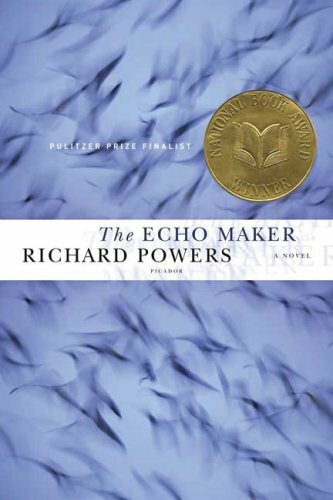 In The Echo Maker, Richard Powers, proves himself to be one of our boldest and most entertaining novelists. Richard Powers is the author of nine novels. The Echo Maker won the National Book Award and was a finalist for the Pulitzer Prize. Powers has received a MacArthur Fellowship, a Lannan Literary Award, and the James Fenimore Cooper Prize for Historical Fiction. He lives in Illinois. What echoes do the cranes create throughout the novel? What do the cranes signify to those who admire them—tourists, environmentalists, local residents along the Platte River? What parallels exist between the echo of the migrating birds and the echoes lurking in Mark’s shattered memory? How would you characterize the sibling dynamics between Mark and Karin? How much of their former relationship remains intact after his accident? Would you have sacrificed as much as Karin did to help an injured brother or sister? What is Bonnie’s stake in helping Mark heal? Is her perception of the world distorted, like Mark’s, or is she actually his best chance for returning to rational thinking? How does she cope with Dr. Weber’s assertion that faith in God has a neurological component? Discuss the Nebraska landscape as if it were a character in the novel. What makes it alluring as well as daunting? In what way does the region’s “personality” mirror that of its inhabitants? Which segments of Mark and Karin’s childhood do they most want to recall? Which memories of their parents continue to hurt them? Is either sibling on a path, perhaps even unwittingly, of carrying on their parents’ legacies? What contemporary environmental concerns are reflected in the showdown over the Central Platte Scenic Natural Outpost? Is Daniel equally zealous about his relationship with Karin? Were you suspicious of Barbara in the novel’s early chapters? How did your perception of her shift? How would you have responded if you had been in her position on the night of the accident? In part three, Karin tells Daniel she thinks Mark might have been better off if she had stayed away. How can we know the difference between selfless and self-serving caregiving? In the end, was Karin right to remain in Mark’s life to such an intense extent? What aspects of body, soul, and memory are presented in the epigraphs appearing throughout the book? Taken by themselves, do these quotations underscore or contradict one another? In what ways did Gerald take on a fatherly role for Karin and Mark? Was their perception of him any more accurate than that of the fans who attended his lectures or saw him on television? What aspects of his true self was Gerald able to reclaim in Nebraska? What do you predict for his future with Sylvie and Jess? From the friends who figure prominently in his life, particularly Duane Cain and Tom Rupp, and the figures who represent fear (such as Robert Karsh) what picture of Mark’s past were you able to piece together? What is the best way to discern the truth when memories clash? Did Capgras syndrome make any aspects of Mark’s perception crystal clear or even closer to reality than his caregivers’ view of life? What universal experiences are reflected in his inability to accept the identity of someone who loves him, or, near the end, to acknowledge that he is fully alive? How did you ultimately interpret the note? For each of the main characters, what did it mean to be no one? In the end, who else was brought back? What does Karin have to discover about the mind’s ability to shape memories? How does her understanding of her past change throughout Mark’s illness? In what ways does The Echo Maker enhance themes in previous novels by Richard Powers you have read? What is unique about his approach to topics as far-ranging as science and history, deception, and devotion?